I'm very happy to present to you this beautiful and elegant 5ft farmhouse dining set. Professionally Spray painted in our gorgeous farrow and ball colour Shaded White this item would add style and grace to any home, The beautifully made Junior Weatcheaf chairs compliment this rustic farmhouse style perfectly adding an elegance and beauty to the set. The seats also come fully upholstered in the stunning Cristina marrone ultima fabric which is a new development in soft handle polyurethane. This means the seats have a very practical yet gorgeous faux leather wipe clean finish and there's also an amazing variety in colours to choose from. Please feel free to ask if there's something in-particular you required. We have finished this set in the very gorgeous taupe colour grey code ULT 1214. ALSO PLEASE CHECK OUT MY. WE HAVE PLENTY MORE LIKE THIS AVALIABLE! This is our Facebook page so please check out what all our recent customers are saying about us! Here at farmhouse furniture we strive in offering our customers beautiful and unique handmade pieces at very affordable prices, we pride ourselves on excellent customer service (see feedback) and continue to offer an amazing variety in farmhouse style furniture. This product in particular is made using 100% solid wood and is finished off with one of our beautiful rustic and carefully chosen farmhouse tops which are stained in our specially mixed rustic oak colour. These surfaces create an elegant and characterful look in any living or dining space keeping with our rustic farmhouse style. An exceptional variety in farmhouse, contemporary and shabby chic chair styles. Full upholstered seat pads that are crib 5 resistant and fire retarded to meet uk standards, There's also a great range of colours to choose from! All our painting is professionally spray painted to the most popular farrow and ball paints. Our table legs simply unbolt for ease of transportation. Height 30 1/2 (78 cm). All Our farmhouse tables and benches are newly manufactured in our workshop and are made from carefully chosen reclaimed pine timber, To compliment the charm of our sets our table tops remain in a rustic farmhouse style. The finish is durable, long lasting and shows all of the woods natural beauty. This piece would grace any home and looks amazing close up so please check out all of our photos, a viewing appointment in our workshop can also be arranged so please feel free to contact me should you require. Fast local deliveries and pick ups can also be arranged so please feel free to ask should you require this service. Looking for chairs or kitchen doors professionally spray painted in a chosen farrow and ball colour? Thank you for viewing this exceptional piece. Be sure to add me to your. The item "FARMHOUSE KITCHEN Table And 6 Chairs Shabby Chic NEW Rustic Thick Pine Top" is in sale since Saturday, January 28, 2017. This item is in the category "Home, Furniture & DIY\Furniture\Table & Chair Sets". 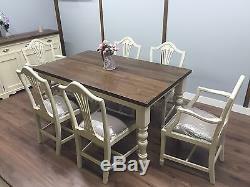 The seller is "farmhousefurniture1" and is located in Brentwood Essex.